Is Lebanon's Prime Minister a Saudi Hostage? 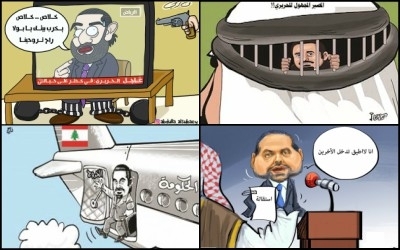 The Hariri saga has been rich fodder for Arab cartoonists. 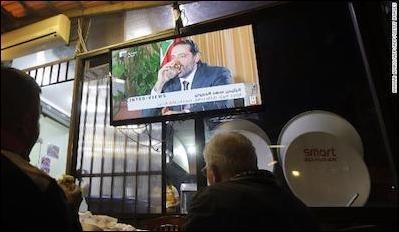 Last week, Lebanese Prime Minister Saad Hariri flew from Beirut to Riyadh, Saudi Arabia, and resigned his post in a televised address, blaming an assassination plot against him and Iranian interference in his homeland. Hezbollah, Iran's pet terrorist army in Lebanon and Syria, claimed the Saudis placed him under house arrest. I dismissed that accusation as ludicrous. Why on earth would Hariri's Saudi allies force him to quit and imprison him? How could Hezbollah explain reports that Hariri was traveling from Riyadh to Abu Dhabi in the United Arab Emirates? Besides, Hezbollah is hardly a reliable source of information or regional political analysis. Yet it's increasingly looking like Hezbollah was right and I may have been wrong. No one is right about everything, and not even terrorists are wrong about everything. Hariri's advisors, according not to Hezbollah but to The New York Times, are shocked and don't know if or when he's going back. If he were free to return home or to leave Saudi Arabia, they would know and they would say so, but they are not saying so. The New Arab cites sources close to Hariri who say they expected to meet him a week ago in Egypt's resort town of Sharm al-Sheikh, that he was summoned to meet Saudi Crown Prince Mohammed bin Salman—who is currently purging government figures for "corruption"—and that the Saudis removed Hariri because they're unhappy with his unwillingness to strongly confront Hezbollah. If Hariri were free to return home, his advisors would know and would say so. But they are not saying so. "What happened in those meetings," one of the sources said, "I believe, is that (Hariri) revealed his position on how to deal with Hezbollah in Lebanon: that confrontation would destabilize the country. I think they didn't like what they heard... For the Saudis it is an existential battle. It's black and white. We in Lebanon are used to gray." Over the weekend, Paula Yacoubian interviewed Hariri in a house he owns in Riyadh on his own Future TV station, hoping to put to rest this bizarre speculation. Instead, the interview fueled it. He was anxious, tense and exhausted. He cried a couple of times. He drank massive amounts of water. "Today, Mr. Prime Minister," Yacoubian said, "I am unable to convince anybody that you aren't a prisoner in the Kingdom of Saudi Arabia, that you're not a hostage, that you're not under house arrest even though we are in your own house." A visibly tense Saad Hariri is interviewed in Saudi Arabia by his own television station on November 12. She said that to her boss, live, on a TV channel he owns. Secretary of State Rex Tillerson said he doesn't believe Hariri is being held against his will in Riyadh, but also that he's "monitoring the situation." It's not just a hysterical rumor, then, if he's monitoring it. It's a "situation." Something is going on. What, exactly, still isn't clear. Michael Young, arguably the most astute analyst of Lebanese politics writing in English, isn't convinced that the Saudis literally have him under house arrest, but he reminded New York Times reporter Anne Barnar that "he is the Saudis' guy...His margin of maneuver against the Saudis is very limited indeed. He's a de facto hostage all the time." Hariri isn't hanging shirtless by shackled arms off a dungeon wall in Riyadh, nor are interrogators beating his feet with rubber hoses. His interview sure looks like a hostage video, though. For years I've been saying that it's often impossible to predict what's going to happen next in the Middle East because so much of what happens over there barely even makes any sense, and no one can predict things that don't make any sense. I can comfortably say that nobody could have seen any of this coming a couple of weeks ago. Saudi Arabia doesn't take foreigners hostage. That's how the Iranian, Turkish and North Korean governments behave. Also, Hariri is a Saudi ally. He's a secular liberal while they are medieval theocrats, but they have common interests and common enemies just like Americans and Saudis have common interests and common enemies despite sharing virtually zero moral or political values. When was the last time any country deposed and arrested the leader of another except at the end of a war? And when was the last time any country deposed and arrested the leader of another except at the end of a war? I can't think of a single time it has ever happened in the modern era. At the very least, it's extremely unusual, and doubly so since Hariri and Saudi Arabia are friends. Imagine the United States taking Britain's Theresa May or Canada's Justin Trudeau hostage. It's absurd. If I read an article by Alex Jones alleging that it had happened, I'd scoff. Yet something very much like that may have actually just occurred in Lebanon and Saudi Arabia. That's how wacky the Middle East is. If you've ever wondered why conspiracy theories are so popular in the region, well, here you go. Consider this episode Exhibit A.